It looks like Santa Royale Citizen Sandi Ego may have called this one: Shot right in the leg. Matching canes. I've finally figured out Adam Miller's super-villain identity: The Skunk! Ever since getting betrayed and shot by the Congress-Man, however, he has struggled to incorporate the cane into his persona. But if the cane shot out his Skunk Musk, that could work. Go with that, Skunk. I'm sure bullets would be no match for your Skunk Musk. Be sure to keep Mary Worth in San Diego where she belongs. Another newspaper needs to know that Mary Worth is hugely popular! Cast your very important ballot by clicking here. I should mention that this isn't the first time the Union Trib questioned their inclusion of all things Mary Worth. Back in 2008, thanks to readers like you, Mary was spared. Let's get out that vote! The newest blight on the boardwalk? Underemployed gangsters who have to mug people just to make ends meet. Fortunately, this is no problem for our dynamic love birds because their souls are on fire, so that gangster with the gun loaded with bullets just better watch out! Lost time? Nah, I certainly haven't lost any time reading this exciting story. Here's a blog entry from 2007. Adam Miller has just called into question my entire blog. I'm going to need to sit down with a large plate of salmon squares and a cup of kelk and ponder this out. Maybe I should be blogging about Judge Parker instead. Did she say full moon? I hope this is where Terry turns into a werewolf, but I will probably have to settle for more midway attractions and Adam aiming at stuff. By the way, I found a new favorite Tumblr: Mary Worth Remix. Whoa, I forgot that Adam is crippled. I'm glad he held up his cane to remind me. I also forgot that Adam and Terry used to be at another table, with a plain pane of glass and levolor blinds. I'm glad they changed seats after they finished their meal -- this table is much nicer. Adam knows best. Trust him, Terry. The time wasn't right. But now that he is getting older and is out of work and can't get a date, the timing is perfect! The hardest part of the Restaurant Dump is timing. Do you start the breakup before the food arrives, like Terry did yesterday, or do you wait until after the food is served, timing each bite so as not to have too much pity time before dessert. Thankfully, Marina Royale seems to have incredibly quick food service, the food being brought out before guests have even closed their menus. Still, boorish Adam looks like he's gone right into pity time, so this may get even more awkward. It may be too early to tell, but I think Marina Royale looks like an excellent upscale alternative to the Bum Boat next door. But I'm not sure I'm ready to commit. Perhaps we should have a trial period. At first I was like, whoa, that's the biggest computer screen I've ever seen, but then I was like, "?" Either that window was installed backwards, or you're outside. Some of you remember my freaky relationship with all things Peanuts. 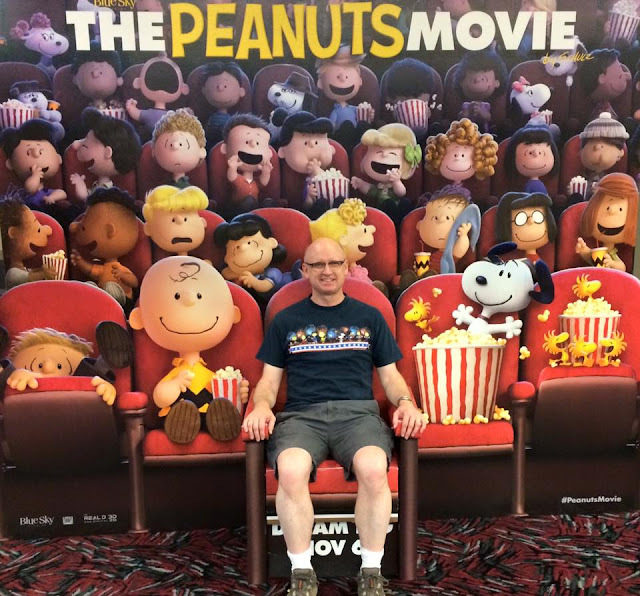 So is it any wonder I'm a little nervous, and a little excited about the Peanuts Movie? Adam's floating head is tilted because of his limp. "Let me quote from Genesis 29:20, KMV (Karen Moy Version)..."
It doesn't quite compare to the KJV. Not quite. You know what's hard to top? Mayonnaise. It's great on everything! "Hey, come on! How come you keep bringing up the past? Let's forget about how I dragged your heart through the dirt, drove you out of my life and across the country, killed your career, and set you on a personal journey of peace and discovery that didn't include me, allowing you to spend eight years healing and finding your own truth. I want you now, and I will have you! Would you like some toast?" "And then, after seven years, I'm going to marry your sister by mistake, and work another seven years for you, and then between the two of you and your handmaids, we're going to have 12 sons who will fight with each other pretty much all the time. It will be so romantic, just like the Bible is so romantic." Adam and I have both gotten a lot more grey since this story began. But, hey, however long it takes. You can always measure the success of a picnic date by how high the man rolls up his pant cuffs. They would be even higher if Adam had remembered to bring a can opener so they could eat something other than dish washer detergent. Meanwhile, Jeff and Adam are having a long drawn out conversation about women, "Can't live with 'em, can't live without 'em," and aiming at stuff. If I have learned anything after 22 years, marriage is saying yes to your spouse all the time. "I've been extracting information from the flower fairies. It's amazing how easily they'll talk when they see Mr. Snips."